"Even though John Philip Sousa wrote an article entitled 'The Menace of Mechanical Music' in 1906, demand for records of the famed Sousa Band was such that numerous recordings of the group were issued. By the time Sousa penned his anti-recording screed, in fact, the first cylinders of the band's music were already 15 years old. 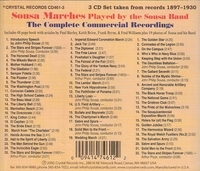 This set collects all of the band's best extant commercial recordings of Sousa's original compositions on three CDs, with some 65 performances in all. 'The Stars and Stripes Forever' is represented four times, once with Sousa himself conducting and three times with Arthur Pryor at the helm. Otherwise, each march is unique; Sousa's band only seldom returned even to cherished marches like 'Semper Fidelis'. The benefit for the modern listener is that this recording includes plenty of Sousa marches you'll never hear anywhere else. A few pieces, such as the very early'The Honored Dead' (which was played at Sousa's own funeral), are somber in tone, but otherwise all the marches -- and it's all marches, with no waltzes, quicksteps, or anything else -- are variations on the mix of martial and lyrical familiar from Sousa's chestnuts. Yet there's something new in each one. Some of the marches are potpourris of existing music or simply include quotations of other familiar tunes. This collection is primarily of interest to lovers of the march tradition or of historical recordings. The producers have done a sensational job in making something listenable out of recordings that were made, in many cases, early in the twentieth century, but the acoustic 78 rpm record, which could not accommodate the sound of drums, was an imperfect medium for the thunder and heavy metal of the march. Anyone curious about how the Sousa Band sounded, though, should at least sample this collection. There are some differences from the modern performance practices applied to Sousa's marches, the most notable being that tones are given a clipped-off quality rarely heard nowadays. Several of the various conductors have their own individual styles; as you listen to these marches, you realize something of the variety of devices Sousa used to showcase the virtuosity of his ensemble, and the conductor who really pushed them to their limits was Pryor. If you're looking for an unusual gift for a Sousa enthusiast, look no further."